If you are not satisfied with cheap conventional $2 hand fans, you have come to the right place. Handy Cooler™ is the first ever swamp cooler (evaporative cooling fan) that is hand-held. This means you can take it literally anywhere. Benefits also include humidifying effects and its aromatherapy functions. 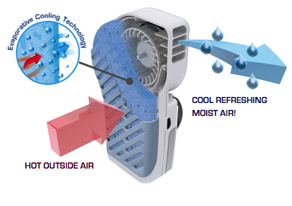 Air can be humidified up to 60%RH on a dry day! This means moisture to where you need it. Also, a few drops of essential oils transform Handy Cooler™ it into a diffuser on your bedside. Who said this was merely a cooling fan? Mobile and portable. Run it on batteries, USB (included), or plug it into a standard 110v socket (adaptor sold separately). We suggest you use your own NiMH rechargeable batteries. Small and handy. Convenience by your side. Euro-inspired design. Sleek and trendy. Emits a soothing cool breeze. You have to try it to believe it. Environmentally friendly. Downsize your appliances to downsize your electricity bills. Cool only yourself rather than the whole house unnecessarily! Air is forced through a large surface area of wet cooling filter and cools down due to evaporation. Once it passes through, the water in the cooling filter evaporates. This cools down the air. Save power = save money! Downsize your home appliances to save energy! Turn off your power thirsty air conditioner and turn on your Handy Cooler™ instead. Just like cars, use something smaller to save energy. This means a saving to your electricity bill too! This personal air cooler is environmentally friendly and energy efficient. Order a home adaptor so it can run anywhere at home or in the office with a power socket!